Within a few minutes of dipping my paddle in Sylvania Wilderness' Crooked Lake, I saw a bald eagle, a pair of otters, a pair of loons, and an incredible shoreline ringed with tamarack, hemlock, maples, and old growth pines! Sylvania is a designated Wilderness Area within the Ottawa National Forest in Michigan's Upper Peninsula, near the town of Watersmeet and on the Wisconsin border. It contains 34 lakes linked by portages to 50 backcountry campsites and also contains trails for hiking and skiing. This rustic, undeveloped area is accessible by boot or paddle, essentially unmotorized. Sylvania is noted for it's exceptional forest and pristine waters. The land in this area was bought and due to its natural beauty, saved from the axe and set aside. In the early 1900's it was turned into a private retreat dubbed "The Sylvania Club" that was owned by several wealthy lumber barons, iron magnates, and auto industry figures. This private club attracted many famous visitors of the time, including Dwight Eisenhower, Bing Crosby, and Lawrence Welk. Eventually, the property was acquired by the U.S. Forest Service and later obtained special Wilderness Area status and protection. In many ways, The Sylvania Club story and history of the area is similar to one of our other favorite paddling destinations that was originally protected as a retreat for the wealthy and then became public land, Wisconsin's Bois Brule River. I've wanted to explore this area for quite awhile and finally had the chance to wrap in a visit, along with a trip to the Wooden Canoe Heritage Association's Assembly (WCHA) in Marquette, Michigan. Throughout the past several years, I've developed a real fondness for river tripping with whitewater runs and the chance to practice working my way up and down fast water with the setting pole, and this has had me doing fewer lake country trips. With Sylvania being about the same distance from home for me as the Boundary Waters Canoe Area Wilderness I just hadn't made it to Sylvania yet. So, when I got the invite to talk about canoe poling at the WCHA Assembly in the U.P., I eagerly accepted. I love wood canoes, I'm always eager to spread the word on the lost art of canoe poling, and, the trip would take me right past Sylvania. My only frustration was that there were so many other interesting waterways in the area that I wish I could have made it a week-long trip. It poured rain on my drive to Marquette, throughout the Assembly, and for most of my drive heading back west across the U.P. Luckily, the rain let up a bit as I was approaching Watersmeet, MI, and I found the Norway Lake Campground in the surrounding Ottawa National Forest. I had the entire place to myself, but with darkness and light rain falling, the only thing left for me to do was call it a night and rack out. The next morning, I awoke to loons calling and enjoyed a short hike along the shores of the mist-covered Norway Lake. I don't know how busy this campground gets mid-Summer, but for a drive-in, established site, it was very nice. 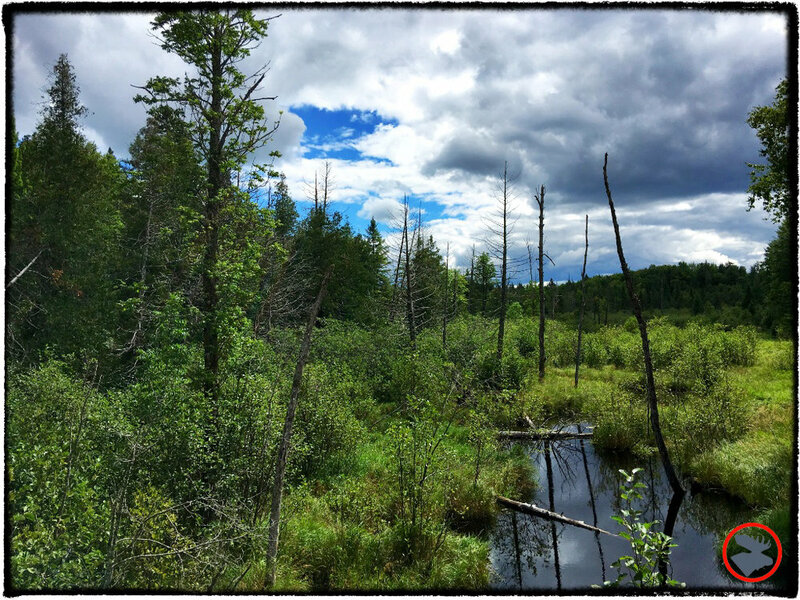 While much smaller than the Boundary Waters Canoe Area (BWCA) or the Quetico, Sylvania is not short of natural beauty and wild feel. It has largely escaped logging and is famous for its northern hardwood old growth forest and clear spring-fed lakes. To protect that wild feel, Sylvania holds many of the same restrictions as the BWCA (e.g., only paddle craft past the entry lake (4hp electric motor max on Crooked Lake), no cans or bottles, barbless hooks and special fishing regulations, and an emphasis on clean leave no trace camping). I've spent quite a bit of time on the BWCA and Quetico lakes, and while similar, Sylvania offers a different feel than those areas. The lakes of Sylvania are generally on the smaller side, the shoreline is forested right to the water's edge, and noticeably absent is much of the rocky ruggedness of the Boundary Waters. There are more hardwoods in Sylvania, but it's not dominated by the familiar oaks of our Mississippi River valley; instead, it contains what seems to be more exotic species, such as hemlock and maple. Photos from Sylvania in Autumn are spectacular! Campsites in Sylvania are set well back from the waterline, which helps not only offer an undisturbed feel to the paddler, but, also offers the camper a chance to live in the wide open understory of this mature forest. Tripping through Sylvania doesn't appear to be as physically challenging as the BWCA or Quetico. The portages are wide, well maintained, and generally flat. Some of the campsites even have nice sandy beaches. If you want a relaxing trip or aren't up to tough portages with the sharp, rocky, footing you'll commonly find in the Boundary Waters, Sylvania may be a better choice. I can already see taking our baby boy here for trips when he's a toddler, and maybe I can get my dad to come out and join us! You can reserve campsites in Sylvania. 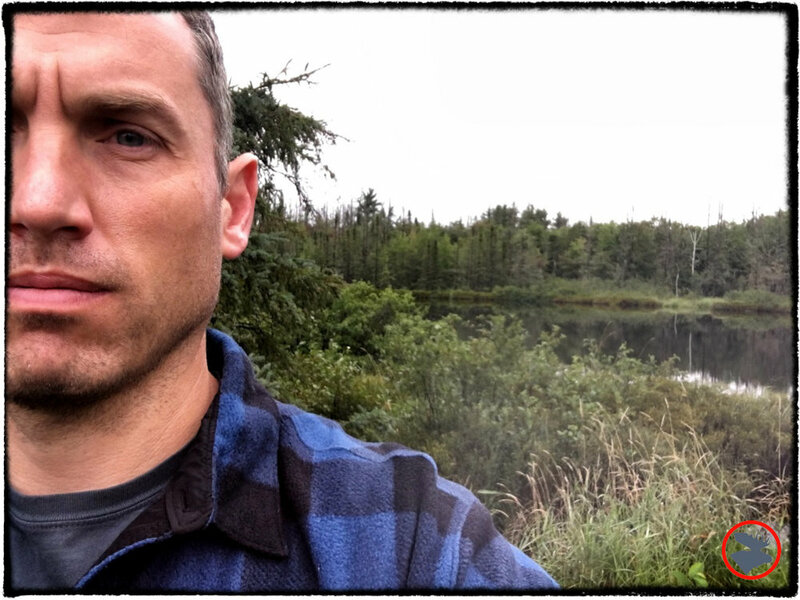 It's no secret that the BWCA gets a lot of love and use during the peak Summer months. If you only have time for a shorter trip, BWCA sites on the entry lakes and popular routes get occupied early in the day, where you cannot reserve campsites. With Sylvania, it's nice to know that your campsite is waiting for you in case you're rolling in late. Two other nearby paddle-in camping destinations offer the same site reservation capability: Wisconsin's Turtle-Flambeau Scenic Waters and the Northern Highlands-American Legion State Forest. Group size and number of watercraft are larger in Sylvania. You can travel in Sylvania with a group of 10, although you are limited to six per campsite. So, it could be possible to reserve nearby sites and split up for eating and tenting. The BWCA's limit is nine people traveling together. Also, the BWCA limits groups to four boats, but there doesn't appear to be such a restriction in Sylvania, which would be very nice for those who like to paddle solo. 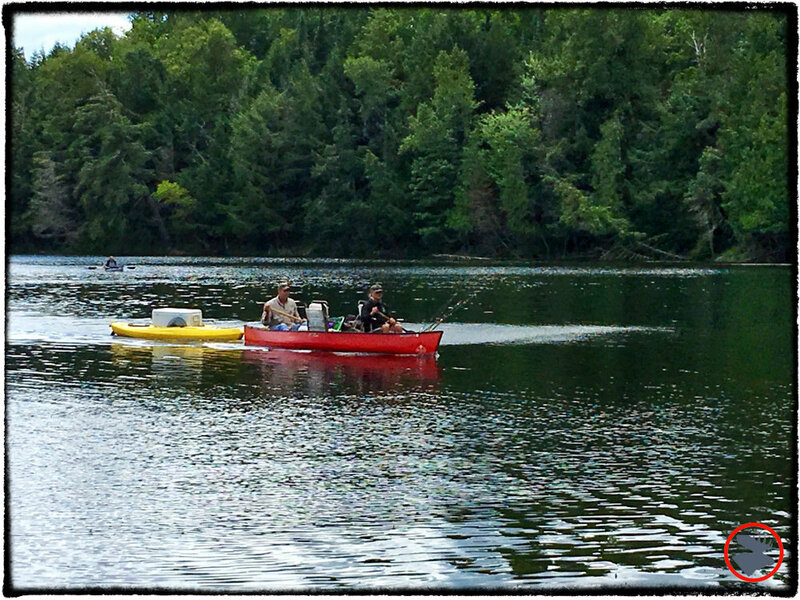 Or like the group I saw paddling into the landing, who had a kayak trailer on each canoe, one of which was loaded with an empty beer keg (check out the photo gallery above). I'm not sure this was entirely above board, but the guys said they had a great time! There are numerous reasons to check out Sylvania for your next canoe trip. This popular, but well managed area will provide a wilderness escape and fantastic natural beauty. I know I'll be back exploring Sylvania as soon as I get the chance! Paddle and portage from one secluded and undeveloped lake to another with only wilderness and wildlife by your side in WI’s little-known and tucked-away Birchwood Canoe Routes. 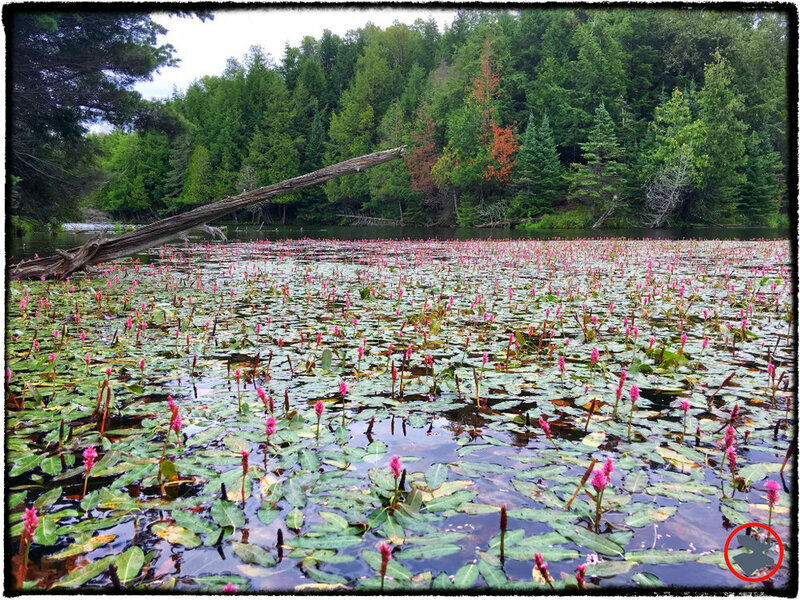 Check out our weekend in Birchwood and start planning your own getaway—just don’t tell anyone about this pristine paddling destination!